In the latest issue of the Proceedings of the National Academy of Sciences researchers showed (yet again) that we make many of our decisions around money and overall trust based on our unconscious racial bias. Psychologists have generally agreed that we have explicit and implicit thoughts that inform our day to day experience. Explicit refers to intentional thinking, decisions and judgments. Implicit thoughts are hidden behind all those good intentions. These implicit biases, or the more technical term for this implicit social cognition have an impact on how we live and work. The researchers showed 50 participants from diverse backgrounds nearly 300 photographs of men who were Hispanic, Asian, Black and mixed race. They were asked to rate how much they trusted them based on the Implicit Association Test (IAT) scale rating from one (“not at all trustworthy) to nine (“extremely trustworthy”). There were also given a test to find out their level of implicit race attitudes or their implicit biases. Thinking about their answer was discouraged. The intent was to get the participants gut reaction once they saw the image. The results showed that the participants who had a strong Pro-white bias rated those who were not white lower on the IAT trustworthy scale. The second part of the study a new group of participants were shown images of those who were in the first experiment. They were told that the individuals in the photos were going to be their business partners for a new financial venture. To add a little bit of hopeful trust, they were told by the experimenter that each potential business partner had been interviewed or screened. 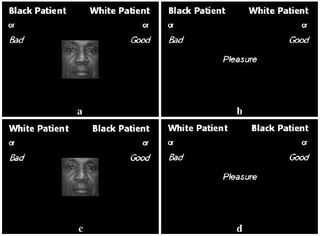 Even with the screening, folks who had a stronger Pro-White bias were more likely to not give money to a black partner. Participants in this study were more likely to base their decisions of trusting another with their money on their implicit racial bias. They were also more likely trust someone according to their own internal/implicit biases. This research is not really new news. Implicit biases become silent and “passive” expressions of discrimination. This isn’t about the sign at the door separates “us” from “them” this is about the subtle appearance of our own biases in social, political, and economic situations. Not acknowledging the presence of hidden biases can undermine the best well intentioned work of communities and policy makers in their efforts to create social change. And as we have witnessed in history, implicit biases have impacted who gets loans (as demonstrated in this study), jobs and even certain levels of medical care. Despite our best intentions to be outwardly inclusive, accepting and trusting, there apparently is an internal mechanism that pushes all that good intention aside. Hopefully, in time, with greater awareness, openness and questioning we can begin to shift our external hopes into internalized beliefs and practices.